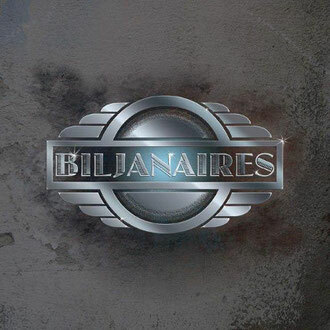 BILJANAIRES is a band from Vancouver in CANADA. In 1998 they recorded their debut CD Prizefighter. Two songs from the CD were placemented in film soundtracks. One of their songs Grunts featured in the international film ‘Christina’s House’ and another song Slaves by Nature on indie film ‘The Falling’. Now the band added new members, a guitar shredder Ken Krazyfingers that will add a twist to the Biljanaires music / vision and a great drummer Scott Aquino that has toured with Canadian rock legends "Trooper". Currently they are still working on the self titled EP with 7 tracks to be released soon. However some of them have already released as a single. Those are available at their online store on ReverbNation. In this August, they have the band logo which is cool design.